It’s that time again. Another election. Lately, Prime Ministers in Japan have lasted less than 2 years. Ever since Junichiro Koizumi retired, there have been 6 Prime Ministers in the last 6 years. They are, in chronological order, Shinzo Abe, Yasuo Fukuda, Taro Aso, Yukio Hatoyama, Naoto Kan, and the current Prime Minister, Yoshihiko Noda. Hatoyama, Kan, and Noda are all from the Democratic Party of Japan, which was the first party to defeat the Liberal Democratic Party after decades of one party rule. Well, the DPJ hasn’t been entirely popular, and the LDP may return as the government after December 16th. Shinzo Abe is the leader of the LDP once again, so he may be the next Prime Minister. It seems that Japan’s government has been quite ineffective and unchanging since Koizumi. The Diet is mostly old guard, unwilling to accept new ideas, and move forward in the 21st century. Change is needed, but it likely won’t happen until the old guys retire and let the younger generation take over. Unfortunately, many young people don’t seem to care about much of anything, so it’s not a good sign for Japan’s future. We’ll see after the election. Campaign speaker van for a local candidate for the lower house. This candidate is a member of the Communist Party. He seemed to have a remarkably interested audience. Lately, there’s been a lot of talk online about some issues happening in Japan. Starting October 1st, downloading unauthorized videos can be punishable at up to 2 years in prison, making people worry that YouTube will be illegal. The government is considering applying the consumption tax to ebooks and legally downloaded music from overseas sources. 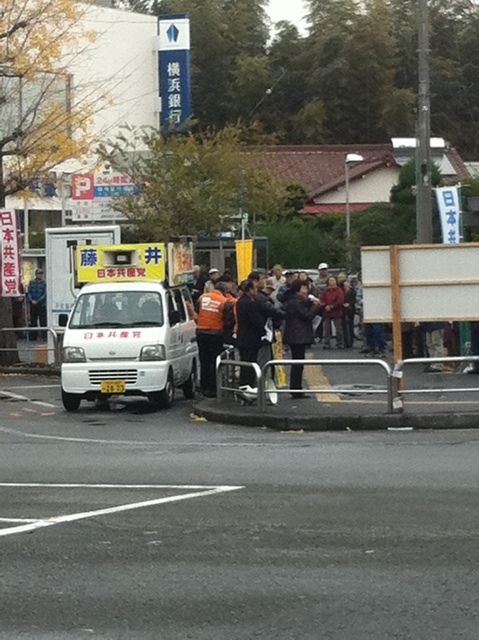 And the big one is the protests about the Oi nuclear power plant being restarted. This last one hasn’t been talked about much by the Japanese media, so there’s been a large amount of discussion online about it. Add in the government not telling the truth last year after the earthquake and tsunami and there’s a lot of mistrust regarding Japanese media and government. Me: North Korea uses media to give propaganda and further their own interests. Me: Would you agree that other countries’ media do the sane thing but to a lesser degree? Him: Yes, I think so. China does it a lot, for example. I think every country does it, except Japan. Me: Oh? Why do you say that? Him: The Japanese government and media have been very honest and open about everything. They don’t hide anything from the Japanese people. Me: What about last year after the earthquake? They weren’t very truthful about the nuclear problem. Him: They told us everything. They always tell the Japanese people what’s happening.